In 1983, the Utsunomiya Hospital Case exposed poor psychiatric treatment and malpractice towards patients with mental illness. Although the Japanese psychiatry establishment stated that the case was exceptional, occurring in only one hospital, deficits subsequently turned out to be more widespread and invited international criticism. In response to this lesson, Japan has changed legislation relating to mental health, and implemented the normalization-socialization programme. Junichi Nozu, a patient with schizophrenia who had been hospitalized in Iwaki Hospital, murdered Makito Yano in broad daylight, perhaps believing that his illness would allow an easy escape from punishment. After the tragedy, Makito's family were told by medical experts, lawyers and even the press that Junichi Nozu should not be punished, due to the "insanity/irresponsibility" provision within Article 39 of Japanese Criminal Law, citing their strong belief in human rights. They insisted that all people with mental illness should be exempted from any punishment in order not to compromise their human rights, thus even charges of homicide should neither be pursued nor discussed at court. Further, people with mental illness should not be sent to jail but instead should receive treatment at a psychiatric institute with the condition that they should be allowed to return to the community after the shortest possible time on medication. Based on this logic, until today in Japan, a person with mental illness who had murdered would most likely be set free - with the risk of repeating the behaviour as a result. Remarkably, no facts, not even the name of the murderer and how the victim died, would be made available to the family of the deceased victim in the interest of respecting the privacy of the "innocent murderer". In Japan, a country where the Constitution guarantees the equal human right to each citizen, the human right of crime victims, however, has been encroached and compromised by the practice of the Criminal Law, which is in the framework of the Constitution. Makito Yano 28, born on 20th August 1977 a citizen of both Japan and the United Kingdom, was murdered on 6th December 2005 by Junichi Nozu, 36, who had a diagnosis of schizophrenia. Their encounter occurred at a shopping centre in Takamatsu City when Makito Yano was about to get into his car after having lunch. He was stabbed in the chest with a kitchen knife which Nozu had bought for 105 yen. In a few seconds Makito died from massive bleeding as his aorta was severed from the heart. The murderer, Junichi Nozu; a psychiatric patient at Iwaki Hospital, had been given permission for short day-time leave under the rehabilitation program. Although Makito Yano was deprived of the right to live, his parents were told that the perpetrator should not be punished and the hospital should be exempted from taking any responsibility. The idea raised questions around the universal application of human rights. Among psychiatric patients committing homicidal acts who are freed by the police or prosecutor without testifying at court, some may have acted in full knowledge that they would likely have the right of exemption from punishment from their premeditated actions. Makito Yano's Parents considered that certain established ideas and practices within Japanese judicial circles should not be accepted and could not be respected in the global community. As Japan is a trusted member of the world community, all practices occurring in Japan, should meet internationally accepted standards. Keeping their grief concealed, they have made every effort to make the Makito case known to the public. They wrote a book entitled "Kyojin", covering as much of the known facts and evidence as possible. They asserted that all murderers, even a person with schizophrenia, should be made to testify at a judicial court and must be examined in the spirit of pursuing a charge of homicide. The book was published while Juichi Nozu was kept for psychiatric examination prior to the announcement of the prosecution. Helped by the public attention, Junichi Nozu was prosecuted for his murderous intent and found guilty. Although with his diminished responsibility his term was shortened he was nevertheless sentenced to 25 years imprisonment. When Junichi Nozu became very irritated, he would inflict tobacco burns on his left cheek, thereby performing "Konjo-yaki" on himself, to ease his mind. Since Konjo-yaki was noted from the start of Iwaki Hospital admission, Junichi Nozu was continuously creating fresh scars and scratches on his face over 14-months in hospital. However, medical staff, (psychiatrists and physicians), nurses and others at Iwaki Hospital took no action in relation to the changes on his face. Dr. T. Watanabe had prescribed only the conventional type of major tranquilizers, but if he had changed to the newer, atypical type, then it is possible the situation might have been changed or improved. 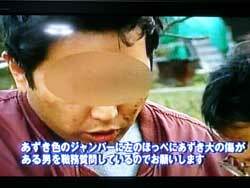 Konjo-yaki was a marker for the police when arresting the murder suspect, and was shown on Television. Yet Iwaki Hospital strongly denied there were any Konjo-yaki scars on Junichi Nozu's face. The hospital even testified at the civil court that Konjo-yaki was a story created by the plaintiff and had never existed. Photos taken from the television footage were submitted by the plaintiff, so Iwaki Hospital stopped insisting that Konjo-yaki was a fake. Has Iwaki Hospital as a psychiatric care-giver been treating their patients without looking at their face? Konjo-yaki, in Junichi Nozu's terms, is the intentional inflicting of tobacco burns on the cheek, involving creating scars and scratches. Iwaki Hospital admitted to finding evidence of this at the time of hospitalization (1st October 2004). Nevertheless, Junichi Nozu kept burning his face in Iwaki Hospital, the scars ever present, but the spots erupting then disappearing over the 14 months. Dr. T. Watanabe, as a superintendent psychiatrist, stopped prescribing the major tranquilizer (antipsychotic drug) to the patient with schizophrenia, without justifying its discontinuation. Iwaki Hospital, in the judicial testimony, had tried to maintain they continued prescription of the antipsychotic, but accepted the discontinuity. Junichi Nozu had incessant trembling which could be attributable to akathisia, but Dr. T. Watanabe, who interpreted the symptom as an illusion, insisted there was no akathisia. Then he prescribed a high dose of Bromazepam; at double the maximum permitted dose limit for weeks, which may cause "paradoxical behavior" to some individuals, but the psychiatrist did not perform the required clinical evaluation. The intramuscular injection of Biperiden is effective against involuntary movement of hands and legs, Dr. T. Watanabe, however, replaced it with a physiological salt solution. Without effective treatment, Junichi suffered from severe trembling, and even suspected whether he had been given the proper medicine, Biperiden or not - as in fact he was administered a physiological salt solution as placebo without his consent. At 10 A.M. on 6th December 2005, Junichi Nozu requested that the nurse ask Dr. T. Watanabe to examine him as an emergency case but the doctor refused the request by the patient under his care. Despite the urgent request, Iwaki Hospital left Junichi Nozu without providing consultation for more than 26 hours. On being told "No" from the nurse Junichi became disappointed and lamented "I have asked for an examination by Dr. T. Watanabe for days, but have been given no-care". Junichi Nozu was clearly upset that morning, but Iwaki Hospital did not incorporate their observations into the day-to-day appraisal of his mental condition, and Junichi Nozu was left without treatments in his room. Two hours later on the same day at 12 o'clock, Junichi Nozu went out from the hospital as per usual with permission, but nobody checked him on leaving. By this time, he had made up his mind to kill someone to release his severe irritation. He went to the shopping centre to buy a kitchen knife, and when coming out from the shop, he assaulted Makito Yano who was about to get into his car. Many in Japanese Psychiatry state that the indiscreet work of Iwaki Hospital is no exception. If poor medical training, inadequate treatment and patient neglect are common, these problems may be caused in part by the existence of the "irresponsibility provision" in Japanese Criminal Law (Article 39). This provision may also fail to protect the human rights of those with mental illness in practice. Lessons have not yet been learned from the Utsunomiya Hospital Case. The Iwaki Hospital Case has been under trial at Takamatsu Local Court since June 2006, the combined plaintiffs being the parents of both Makito Yano and Junichi Nozu, each aiming for restoration of their infringed human rights. We offer our sincere thanks to Dr. Simon J.C. Davies, D.M. (Oxon), M.B.B.S. (Lond),M.R.C.Psych, M.A. (Oxon), M.Sc. (Florence/Maastricht),Dip. Epidemiol. Clinical Lecturer, Academic Unit of Psychiatry, University of Bristol, U.K., for his advices, helps and co-operations.